Discussion How do i change the fonts? How do i change the fonts? This discussion is related to the Nebula addon. Is there a way to change the fonts? The letters are way too thin and really hard to read. in the theme custom.css generally. Can I use fonts that i upload to my databases or am i stuck with webfonts? You can add fonts of any kind , please download the marquee plugin which has the whole explanation of how to add other fonts and also has fonts . This way you can see how to do it . I got around to installing Marquee, but it just put some hideous rolling text on my forum page. I'm looking to replace the font on my forum to Trocchi, do i upload the OTF files to some directory in my database using FZ? you don't have to use the marquee, but it serves as a place to store your fonts locally and just put the url to where they are. 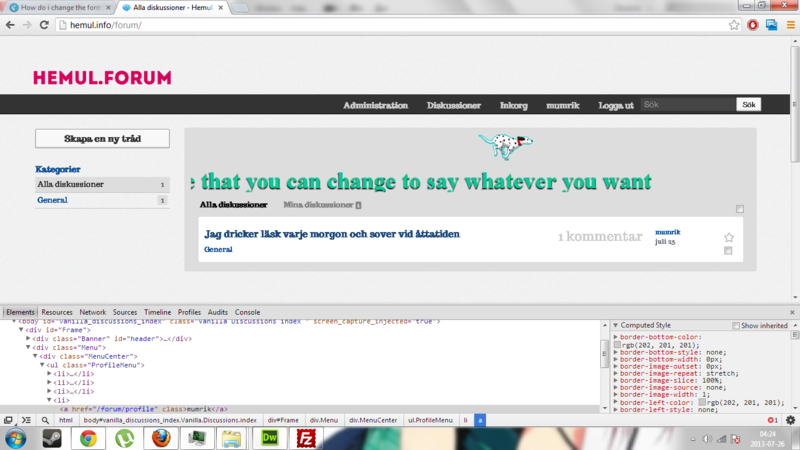 So upload your fonts into the plugin's fonts folder then use the css code to put them in the theme so they are called. Then use that font-family name on the font style in your theme.
. edited: never mind she beat me to it with a better answer. you would probably want to put them in the design folder of theme or a subfollder e.g. design/fonts and point to them. Is it possible to cheat here? Would it work if i uploaded Trocchi and then just renamed it to the font I'm currently using? To save myself some time. I was kind of guessing - that's why i edited it out. the theme experts will know, but i would have to experiment myself since i don't know! Especially since i've never looked at the theme. OHHHHH! I finally got it figured out. But if I do this with fonts not natively installed on PC's, will it all be redundant? I can't see the new font on my phone. Not sure how you are using them but the way I recommend is the only way I know for it to work. Changing the name of a font might not work. Specially if something else is calling some other font. The only way to make sure you are using that font and everyone can see it not just you coz it's on your computer installed, is the way I used for the marquee plugin. You must include the font-face in the css style sheet. No other way and it is not time consuming, just copy the css sheet into a text editor and find all the font-family whatever it is and change it. Or add it. You can also add this and see if it affects everything or just some thing s then add the family to those. I changed the menu font from the original Inherit to Trocchi. I can see it in my browser, but on my phone i cannot. Are you looking at your phone's mobile theme or full site theme? You will need to add the font-face to the mobile theme as well . One way to tell is to use that font on the marquee. I tested the marquee and it works also on mobile. So it is a matter of seeing if the fonts are being called. Also if you just change the names and other people do not have those fonts installed in their computer or mobile, they will not be able to see the fonts they will get a default font. That is why I say that doing it like I describe in the marquee css will ensure the fonts are called and installed for everyone. I am using the full site theme on my phone, that's why I can't understand why it doesn't work. I added the font to the Marquee plugin already. then paste the nice code back. I can't possibly work on code that is this messy. I made a plugin that changes font face, http://vanillaforums.org/addon/vfonts-plugin-1.0 you can add your font and try it. Let me know how it works , this will also change the font in the mobile. Here is the style sheet for that theme I fixed it and organized it just switch it out. If you use the Fonts plugin I made, add your font to the folder and then add the url to the font in the css style sheets for the fonts plugin. I added the code at the bottom of the custom.css so you can find easy. you know what might be the problem? can you post or link the css file?